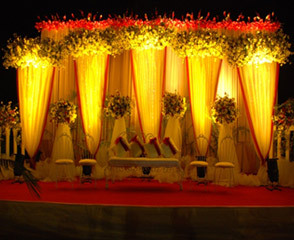 The Wedding Bridal Stage is an important part of Hindu wedding decor and is usually decorated with pillars and drapes lit up and adorned with fresh flowers as the bridal couple are seated in their throne just after they have been pronounced as husband and wife. 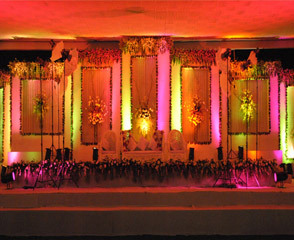 The bridal stage is used not only for the bridal couple to sit and for photography but sometimes for certain rituals as well. 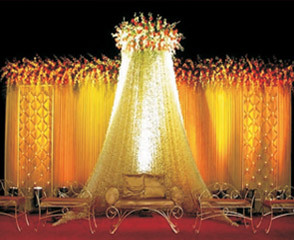 Many couples prefer to use their bridal stage instead of a mandap or vice versa. 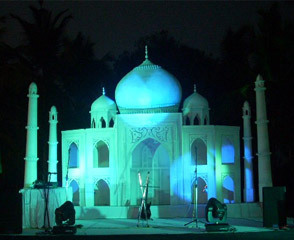 The stage can also be used for the Jaimala ceremony. The main purpose of the stage however is for the couple to be seated for photography along with their family and friends. The wedding stage could be theme based with a royal touch by using designs of famous Rajasthani palaces and even the Taj Mahal. 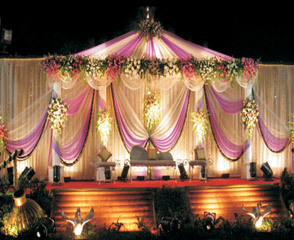 Most bridal stages follow the same wedding theme similar to the theme of the mandap, the entrance décor and the general colour scheme of the entire wedding. Some couples also prefer top tables or head tables where they can sit with their entourage and family on one long table. This is a more western concept where the bridal couple sits at their stage with a well decorated backdrop wit floral décor and roman pillars. Beautiful ornaments and artifacts are added to the wedding stage which gives you better photographs which last you for a lifetime. 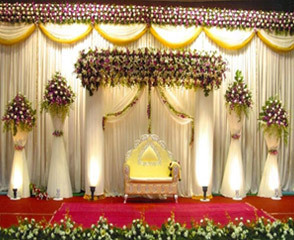 Goa Wedding Decorators will help you choose from a number of themed bridal stages which will not just be a part of your décor but will also help you preserve picture perfect memories. Contact Us today for unique stage designs & prices.